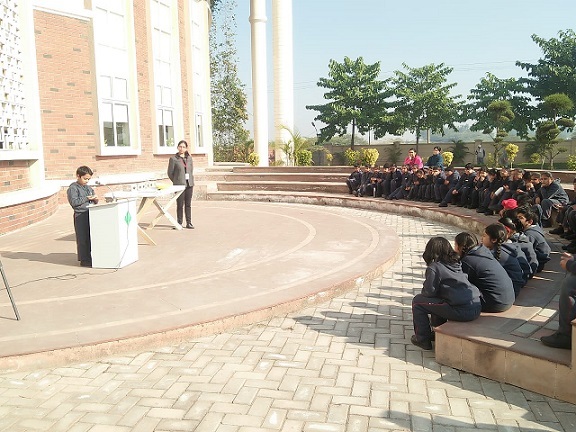 A "Show and Tell" inter house activity was performed in classes 1 and 2 for enhancing speaking skills among children. They were given an object and were asked to speak 5 to 10 lines describing the object. They have been assisted with list of adjectives for help. The activity helped them to develop the speaking skills and to overcome shyness and the fear of public speaking. 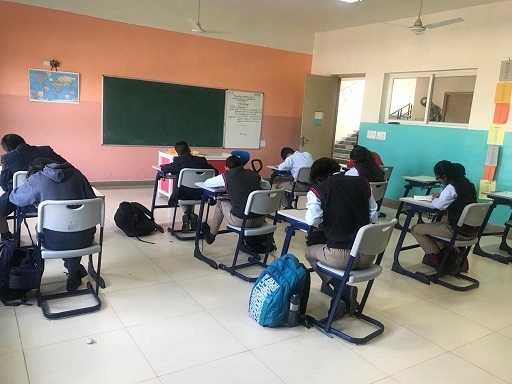 In order to inculcate the spirit of honesty, integrity and responsibility, exams were conducted for the students of Grade 9 of ATS Valley School, Dera Bassi without invigilation. Students were motivated by the experience to work even better towards the values and implement them in their day to day activities. 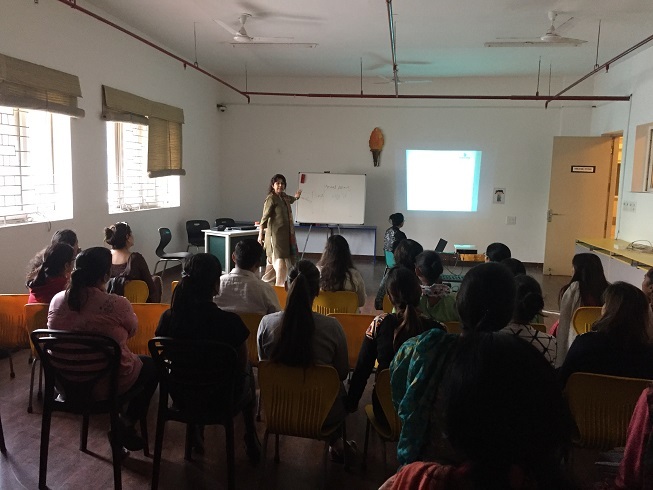 Teachers of ATS Valley School, Dera Bassi undergo training on a regular basis on topics ranging from "How to communicate better with children" to working on the "Optimism and Happiness Index". 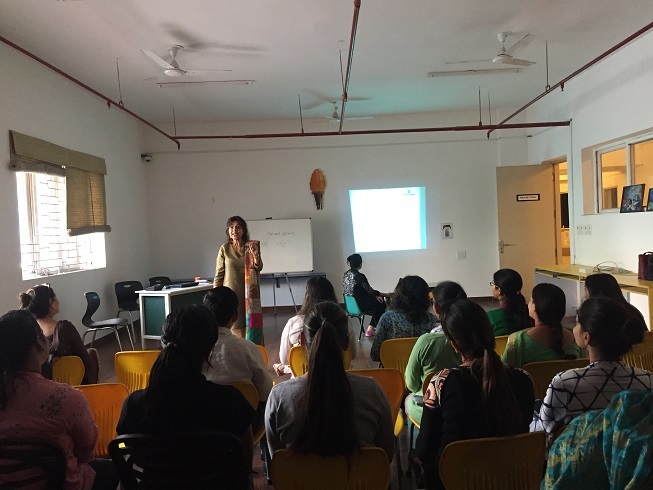 Training on such topics by experts helps build the confidence of the teachers which ultimately leads to increase in the efficiency and confidence level of students. Saving energy through simple measures, such as turning off lights and fans in unused rooms can provide us the environment with a wide range of benefits. Grade 3 students are being taught in their monthly attribute responsibility. They knew that one of the most immediate benefits of saving electricity is the amount of money we can save each month on our utility bills. Reducing our electrical use can also benefit our health. For example, turning off the television may encourage children to go outside and play or do something more active. Choosing to play board games instead of video games--saving electricity in the process--helps increase the health and happiness in families by providing time together. Sometimes it’s the simple things in life that are the most rewarding. Cycling is a fun and free activity that children can enjoy with friends and family. Nothing compares to the simple pleasure of a cycle ride.Learning to ride a cycle is an important skill that every child should learn. Our grade 1 students have started learning to ride bicycle in the school. There may be a few wobbles and scraped knees in the beginning but once they’ve mastered it, it is a skill that will stay with them for life. Children get great practice with balance as they lift their feet off of the ground and up to the pedals before initiating movement. Riding a bicycle not only improves physical fitness, it also benefits child’s learning development and mental health. Children who ride bicycle are more focused and ready to learn. Taking part in regular physical activity also has links to increase happiness, as well as giving children more opportunities to make social connections. Teaching children to trim their own nails is an essential part of their self- care routine. They do learn a few self care tasks gradually over the course of time but trimming their nails without hurting their fingers largely depends upon child’s motor skill development. Some children are ready before others. As the nail cutter is a sharp tool, we train our students right from Grade 3 onwards to trim their nails properly before allowing them to perform this task independently. Regular classroom practice and talk on self care helps them to follow and incorporate such hygiene and self grooming practices in their routine. They visibly become self- confident and independent. Few of them who bite their nails, feel discouraged to do so after getting rid of them. When they trim their nails they feel grownup and proud of being able to manage their hands. In an effective classroom teaching, students should not only know what they are doing, they should also know why and how. Teachers at ATS Valley School have adopted this measure “Teaching between the lines” which facilitates a step by step and engaging learning journey for the students and imparts an increased understanding of the concept. Our purpose behind this idea of teaching between the lines is to replace an empty mind with an open one. Mining the concepts for deeper meanings and linking to known knowledge means to stretch the lessons in different directions. These connections will allow our students to engage in relevant, meaningful ideas that can be related to real life. It is great for developing patience, perseverance, problem solving skills, strong motor skills, attention to detail and enhancing productivity. It not only helps to learn a hobby that is fun and artistic, it teaches math, critical thinking and spatial awareness. In Group C, every student from Grade 3 onward has learnt the basic skills of stitching like hemming and how to stitch on buttons. For young students though it is incredibly difficult to control the direction of thread or fabric, but after the completion of any given project they felt a sense of capability. Self-confidence rises out of a sense of competence. In other words, students develop confidence not because we tell them that they are doing good things but because of their small yet meaningful achievements. In Sanskrit, Namas means– salutation- bow, Kar means hands, Te means–to you. “I bow to you” I bow to all good, positive qualities in you. In simple words, Namaskar or Namaste is a way of showing respect to each other. We must ensure that our kids respect their elders. If we give them the right kind of training, from the beginning only, it will get inculcated in their behaviour and they will start practicing it as they grow. Meaning and importance of doing Namaste was explained to the students in the assembly with the intent of understanding and knowing our culture. Our children need to learn that others matter. Any expression of courtesy and respect reinforces that. It begins in the heart. It emanates from a genuine respect for others. That’s why we are training our students to greet others simply with their hands folded and a polite “Namaste”. School garden learning is different from most other learning programmes. When students plan, plant, care for, and analyze their gardens, science and learning take on meaning like never before. School-age children need a good diet in order to develop and grow well, to study, to stay protected from diseases, and to have the energy to get through the day. For the sake of our children’s future, they need not only to eat well, but also to learn how to eat well, and how to grow their own food if necessary. Our school is well placed to show our students how to go about this, because at this age they are open to new ideas and pick up good habits and new skills easily. There were few more rewarding experiences – for our students than watching the seeds they have sown, sometimes more in hope than expectation, pushed up through the soil and grown into beautiful flowers or vegetables which were given to their parents. Not only does gardening provide opportunities for increasing scientific knowledge and understanding and improving literacy and numeracy, but also improves students’ confidence. It gives them a sense of responsibility and fosters positive behavior. It is easy to assume that the small amount of material recycled in an individual place makes little difference environmentally. However, reproducing the effort of one business through the country leads to major improvements in the environment. Keeping this thought, in our school we have started paper recycling as a part of Group C activity, in which our students are learning simple steps of paper recycling which is a significant contribution to improving the environment. Making recycled paper pulp, compared to generating pulp from trees and other plants to make new paper products, consumes less energy and water. By fostering the awareness of recycling among our students, we are sensitizing them to be the responsible human beings towards the environment. It’s time to encourage our children to become more independent with their daily living skills - a normal and healthy part of a child’s development. Children can learn so much from doing things by themselves. It may not be perfect at first and not exactly how we would do it but we are giving our children the opportunity to grow each time they are able to try something new, on their own. Students of Grade 2 were provided with shoe polish and brushes and were taught to polish their own shoes. Practicing self help skills was a fantastic way to help them feel capable and increase their self-esteem. This activity helped creating a great sense of autonomy; a drive to learn and grow. They gained confidence in their ability to try polishing their shoes and pride in their independence. Asking questions- the single most important habit for innovative thinkers. Children learn by asking questions. We encourage our students to ask questions everyday as it is the simplest and most effective way of learning. Brilliant thinkers never stop asking questions because they know that this is the best way to gain deeper insights. If we keep asking questions we can keep finding better answers. All the great inventors and scientists asked questions. Isaac Newton asked, “Why does an apple fall from a tree?” and, “Why does the moon not fall into the Earth? Grade 1 to 8 questions that our students asked to quench their curiosity. Why the clouds are black and white in colour? Why don’t we feel rotation of the earth? Why people say, ‘Bless you’ when anybody sneeze? Why do we feel pain when we get injured? Why do some plants eat insects? Why does the crazy ball bounce? Why are people addicted to cell phones? Everyday intelligent questions are stimulating, provoking, informing and inspiring our students to great extent.